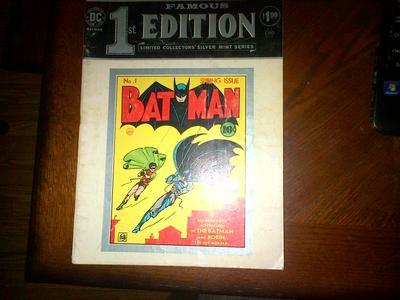 Famous 1st Edition,Limited collector's silver mint series, No.1 Batman, Spring Issue 1940. Editor's reply: This is a nice thing to have, especially for Batman comic book fans without the means to own the original comic! However, as these prices show, it's really not worth very much on the open market. Published in the 1970s, FFEs reprinted many rare comics that collectors would otherwise seldom, or never, see, or be able to own. This oversize comic book is more like a magazine format. 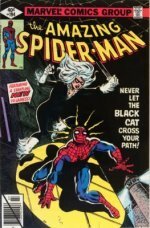 The outer cover is actually the only difference between Famous First Editions and the original comics they reprint. 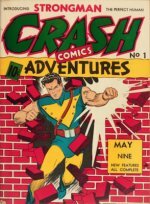 This has led to many instances of the outer cover being removed, and the comic being passed off as a Golden Age original. Buyer beware! Yours is a nice reading copy, but nothing more than that. Thanks for sharing it though. "The outer cover is actually the only difference between Famous First Editions and the original comics they reprint." Not quite. All the Famous First Edition inner covers had minor changes made to enable collectors to identify them as reprints. 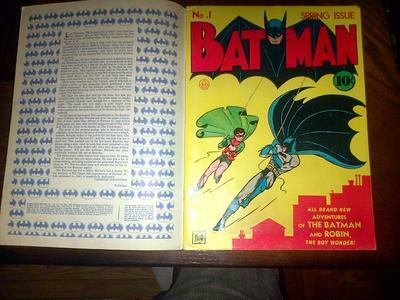 For Batman #1, the original (and the FFE outer cover) had a red building in the lower left corner, which was missing on the inner cover.